Here are some great Easter basket gifts from Townley Girls that both boys and girls alike will love. Disney Tsum Tsum Hair Clips which comes in a package of 12 that are puffy and snap in girl’s hair that has her favorite Tsum Tsum character on it from Mickey Mouse, Minnie Mouse, Bambi and more. Disney Frozen 6 Nail Polish with File her fingers may feel frozen in the winter, but her nails can be Frozen inspired. Six nail polishes and a fabulous nail file will give her everything she needs to maintain the perfect manicure. Spider-Man Lip Ball with Bouncy Ball Now your little superhero can moisturize his or her lips and have a blast while doing it. This Spider-Man lip balm comes with a bouncy ball, so the fun never ends! 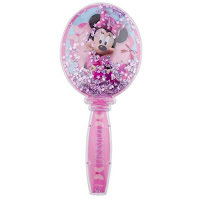 Minnie Mouse Glitter Globe Hair Brush Now your little mouse can maintain her hair the Minnie Mouse way! This adorable Minnie-inspired glitter globe hair brush is fun and glamorous- perfect for styling hair. Beauty and the Beast 4 Pack Lip Gloss Set with Bonus Tin She can look as beautiful as a rose with this Beauty and the Beast lip gloss set. Rose-tipped lip glosses (Grape, Raspberry, Blueberry, and Berry) will give your little princess something to smile about. And she can store all her treasures in the included bonus tin! Emoji Hair Brush If she's just #toocool, then she'll adore this hair brush. Colorful and fun, it's too cool for most people but perfect for her! My Opinion: Townley Girls always has such great stuff you do not see anywhere else and perfect for Easter baskets. The Emoji Hair Brush is perfect for a teenager and the other items are perfect for young girls, Spider-Man is perfect for boys. I like the Disney Princess Cosmetic set! My daughter would love the princess cosmetic set. How cute!